BROOKLYN, NEW YORK CITY - Circa, June, 2015 - An establishing shot of lower Manhattan and the Brooklyn Bridge as seen from Brooklyn as the East River Ferry passes by. 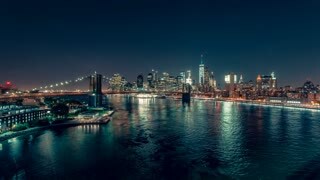 Lower Manhattan at Night | New York City | 4K timelapse stock footage of Brooklyn Bridge and the Lower Manhattan filmed from Manhattan Bridge. Aerial view of the New York, America. 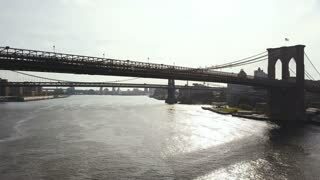 Drone flying over the Brooklyn bridge to Manhattan bridge through the East river. 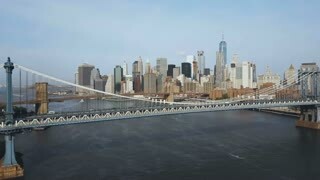 Aerial view of the Brooklyn bridge in New York, USA, going to the Manhattan district. American flag waving on the wind. 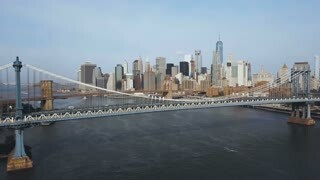 Aerial view of Brooklyn bridge through the East river from the Manhattan to Brooklyn in New York, America. Aerial view of the East river in New York, America. 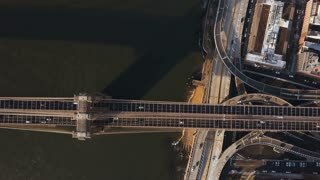 Drone flying over the Brooklyn bridge, view on Manhattan bridge.